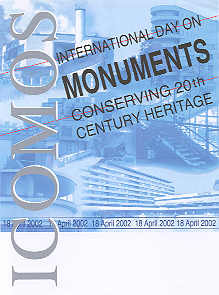 We call on ICOMOS members and professionals in the preservation field to make this day a global success. Recent heritage, particularly that associated with the classical modern styles, is an important part of our common heritage, as it expresses major architectural and social developments. 20th century heritage sometimes suffers of a lack of recognition and protection especially when compared to « older » or more traditional heritage. In addition, sophisticated designs and often experimental technology give it additional vulnerability. Simple changes to meet more current needs, can alter the subtle architectural qualities of the buildings. Furthermore, the large quantity of such buildings or urban complexes creates a problem for establishing protection and conservation priorities. ICOMOS encourages national and international committees and members to organise activities for the discovering of 20th century buildings, gardens, works of art or design, structures, cities or sites, and their 19th century precursors. The secretariat sent to all national committees a call for participation, and suggested activities to be conducted.